This image shows a region in Saturn's outer B ring. NASA's Cassini spacecraft viewed this area at a level of detail twice as high as it had ever been observed before. And from this view, it is clear that there are still finer details to uncover. 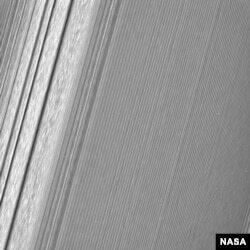 New images of Saturn’s rings reveal the greatest detail yet of the planet’s signature trait, including what NASA calls “moonlets” embedded in them. The images were taken by NASA’s Cassini probe, which is in the final stages of its mission that includes “20 orbits that dive past the outer edge of the main ring system” before the spacecraft plunges into the planet itself. "These close views represent the opening of an entirely new window onto Saturn’s rings, and over the next few months we look forward to even more exciting data as we train our cameras on other parts of the rings closer to the planet," said Matthew Tiscareno, a Cassini scientist who studies Saturn's rings at the SETI Institute in Mountain View, California. The “ring-grazing” orbits began last November and will continue until the end of April, and in addition to spotting the moonlets, they have given greater clarity to other structures within the rings such as the so-called propeller-like formations. NASA added that Cassini has also provided the “closest-ever” glimpses of two small moons, Daphnis and Pandora.